Puntos Necesarios: 17650 Tenga en cuenta que, de momento, no se puede descargar contenido de nuestra plataforma directamente en un dispositivo móvil (teléfono, iPod, iPad, tabletas ...). Necesitas descargar sus artículos en un PC o Mac y, a continuación, transferirlos a su dispositivo de forma normal. Estamos trabajando para permitir que las descargas directas a los dispositivos móviles, pero esto no es posible en la versión actual de la plataforma. Perdón por las molestias! NOTICE: Activation key must be used on a valid Steam account. Requires internet connection. 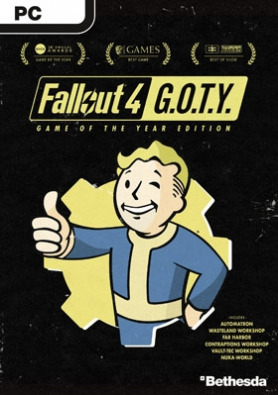 Fallout 4: Game of the Year Edition Fallout 4: Game of the Year Edition includes the fully updated original game along with all six add-ons: Automatron, Wasteland Workshop, Far Harbor, Contraptions Workshop, Vault-Tec Workshop, and Nuka-World. About the game	Return to the Wasteland on Septem… ber 26 with Fallout 4: Game of the Year Edition. With all the latest gameplay updates, graphical enhancements, the ability to play Mods for free on PC and consoles, plus all official add-ons included, this is the ultimate way to experience the award-winning post-nuclear adventure from Bethesda Game Studios. Winner of more than 200 “Best Of” awards – including the 2016 BAFTA and 2016 D.I.C.E. Game of the Year – Fallout 4 is the studio’s most ambitious game yet. As the sole survivor of Vault 111, you enter a world destroyed by nuclear war. Every second is a fight for survival, and every choice is yours. Only you can rebuild and determine the fate of the Wasteland. KEY FEATURES	Freedom and Liberty! dDo whatever you want in a massive open world with hundreds of locations, characters, and quests. Join multiple factions vying for power or go it alone, the choices are all yours.You’re S.P.E.C.I.A.L!Be whoever you want with the S.P.E.C.I.A.L. character system. From a Power Armored soldier to the charismatic smooth talker, you can choose from hundreds of Perks and develop your own playstyle. Super Deluxe Pixels!An all-new next generation graphics and lighting engine brings to life the world of Fallout like never before. From the blasted forests of the Commonwealth to the ruins of Boston, every location is packed with dynamic detail. Violence and V.A.T.S. !Intense first or third person combat can also be slowed down with the new dynamic Vault-Tec Assisted Targeting System (V.A.T.S) that lets you choose your attacks and enjoy cinematic carnage.Automatron! The mysterious Mechanist has unleashed a horde of evil robots into the Commonwealth, including the devious Robobrain. Hunt them down and harvest their parts to build and mod your own custom robot companions. Choose from hundreds of mods; mixing limbs, armor, abilities, and weapons like the all-new lightning chain gun. Even customize their paint schemes and choose their voices! Wasteland Workshop! With the Wasteland Workshop, design and set cages to capture live creatures – from raiders to Deathclaws! Tame them or have them face off in battle, even against your fellow settlers. The Wasteland Workshop also includes a suite of new design options for your settlements like nixie tube lighting, letter kits, taxidermy and more! Far Harbor! A new case from Valentine’s Detective Agency leads you on a search for a young woman and a secret colony of synths. Travel off the coast of Maine to the mysterious island of Far Harbor, where higher levels of radiation have created a more feral world. Navigate through the growing conflict between the synths, the Children of Atom, and the local townspeople. Will you work towards bringing peace to Far Harbor, and at what cost? Far Harbor features the largest landmass for an add-on that we’ve ever created, filled with new faction quests, settlements, lethal creatures and dungeons. Become more powerful with new, higher-level armor and weapons. The choices are all yours.Contraptions Workshop!Machines that sort! Machines that build! Machines that combine! With Fallout 4 Contraptions, use conveyer belts, scaffolding kits, track kits, even logic gates to construct crazy and complex gadgets to improve your Wasteland settlements. The Contraptions Workshop also includes all-new features like elevators, greenhouse kits, warehouse kits, fireworks, armor racks and more!Vault-Tec Workshop!Build a brighter future underground with the all-new Vault-Tec Workshop. Create a massive Vault and attract new Dwellers using pre-war industrial kits complete with retro-nostalgic furniture, lighting, and art. And like every good Overseer, run Vault-Tec approved experiments on your Dwellers to learn what makes an ideal citizen. Vault-Tec has given you the tools, the rest is up to you!Nuka-World!Take a trip to Nuka-World, a vast amusement park now a lawless city of Raiders. Explore an all-new region with an open wasteland and park zones like Safari Adventure, Dry Rock Gulch, Kiddie Kingdom, and the Galactic Zone. Lead lethal gangs of Raiders and use them to conquer settlements, bending the Commonwealth to your will. Nuka-World features new quests, Raiders, weapons, creatures, and more. Enjoy the ride!Required configurationWindows - MinimumOS: Windows 7/8/10 (64-bit OS required)Processor: Intel Core i5-2300 2.8 GHz/AMD Phenom II X4 945 3.0 GHz or equivalentRAM: 8 GB RAM Hard disk: 30 GB free HDD spaceVideo card: NVIDIA GTX 550 Ti 2GB/AMD Radeon HD 7870 2GB or equivalent Windows - RecommendedOS: Windows 7/8/10 (64-bit OS required)Processor: Intel Core i7 4790 3.6 GHz/AMD FX-9590 4.7 GHz or equivalentRAM: 8 GB RAM Hard disk: 30 GB free HDD spaceVideo card: NVIDIA GTX 780 3GB/AMD Radeon R9 290X 4GB or equivalent © 2017 Bethesda Softworks LLC, a ZeniMax Media company. Trademarks belong to their respective owners. All Rights Reserved.